A regular breeding species and migrant; since 1998 there have been occasional reports of individual birds observed during the winter months from the Twin Cities south to the Iowa border. The Franklin’s Gull was a rare species during the Minnesota Breeding Bird Atlas (MNBBA). The Franklin’s Gull is strictly a species of the interior Great Plains, stretching across the Canadian Prairie Provinces of Alberta, Saskatchewan, and western Manitoba south into Montana, Oregon, Idaho, Utah, Wyoming, the Dakotas, and western Minnesota (Figure 1). Breeding densities are high wherever this highly colonial species nests. Assigned a Continental Concern Score of 14/20 by Partners in Flight; ranked as a Species of Moderate Concern by the North American Waterbird Conservation Plan and identified as a Common Species in Steep Decline by the North American Bird Conservation Initiative. Officially listed as a Minnesota Special Concern Species and designated a Species in Greatest Conservation Need by the Minnesota Department of Natural Resources. The Franklin’s Gull was identified as a Target Conservation Species by Audubon Minnesota. A long-distance migrant that primarily winters along the Pacific Coast of South America. Feeds primarily on insects, both aquatic and terrestrial, and small fish. Often feeds in agricultural lands adjacent to nesting colonies. A semi-floating mat of emergent vegetation often perched atop a mat of vegetation from the previous breeding season; old muskrat houses are also used. Breeding distribution and relative abundance of the Franklin’s Gull in North America based on the federal Breeding Bird Survey, 2011-2015 (Sauer et al. 2017). The Franklin’s Gull was formerly found throughout the state’s western grasslands from the Iowa border north to Canada. Roberts (1932) considered it an abundant summer resident, nesting “throughout western Minnesota in great colonies.” Its fidelity to a given nest site was quite low. “Unlike most birds that breed in colonies, they usually change nesting-sites from year to year; in successive years these may be miles apart, though still within the limits of the same big lake or slough. Occasionally, however, the birds arrive in force at the old locality and then, after a brief stay, all disappear to locate for that season at an entirely new lake.” Roberts surmised that changes in water levels or food availability might be responsible. Despite his comments on their wide distribution, the only documented nesting account was from Heron Lake in Jackson County, where at least 50,000 nests were reported in 1916 (Roberts 1932) and 100,000 nests in 1937 (Green and Janssen 1975). When Green and Janssen (1975) provided their updated account of the gull’s status decades later, they reported that nesting had been documented at only two locations since the 1960s: 1) Lake Osakis in Todd County; and 2) the Agassiz National Wildlife Refuge (NWR) in Marshall County. A few years later, Janssen (1987) also mentioned that breeding had been reported from Clay, Kandiyohi, Traverse (1942), and Wilkin Counties. Since 1970, however, nesting had only been documented in three counties: Marshall (Agassiz NWR where the total number of birds ranged from 0 in 1980 to 65,000 in 1982, and Thief Lake Wildlife Management Area (WMA) where 5,000-10,000 pairs were reported in 1980); Jackson (2,000-3,000 nests at Heron Lake in 1986); and Todd (5 nests at Lake Osakis in 1981). By 1998 no new nesting sites had been documented (Hertzel and Janssen 1998). One of many challenges with the Franklin’s Gull is that observers variously report the size of the colonies as broad estimates of the total number of adults, the number of pairs, and/or the number of nests, making it difficult to assess the true status of the breeding population. Overall, since the early twentieth century and up to the initiation of the MNBBA, reports suggest that nesting was confirmed or attempted at 16 different sites stretching from Jackson County in the south, north to Marshall and Lake of the Woods Counties, and east to Kandiyohi County (Pfannmuller 2014). Documentation for the Clay County nesting record mentioned by Janssen (1987) could not be found. The vast majority of sites are used for just one to three years before they are abandoned; two of the 16 sites were sewage lagoons. Despite the range of sites identified, only three large wetland complexes have been used repeatedly in the past hundred years: Agassiz NWR and Thief Lake WMA in Marshall County and Heron Lake in Jackson County. Rarely are all three sites used in a given year. Despite the large size of most nesting colonies, field reports documenting the location, size, and ultimate success of these colonies have been sporadic, making it difficult to assess the gulls’ movements within a given season or even over a few years. Although Heron Lake supported the largest known colony in the early 1900s, activity at the site has dramatically decreased since then. Breeding records were largely absent from 1949 to 1983 (Vorland 1984). Intensive cultivation in the lake’s small watershed means that spring and summer rains have an immediate impact on water levels, often drowning nests, eggs, and young. Conservation efforts in the watershed have improved, but the site is still used only intermittently. Since 1984 documented nesting attempts were limited to four years: (1) 2,000 nests in 1984 (Vorland 1984); (2) 100 nests in 1985 (Wilson and Shedd 1986); (3) approximately 2,000 to 5,000 nests in 1986 (Shedd and Wilson 1987; Janssen 1987); and (4) approximately 500 young observed in 1992 (Chaffee 1992). Annual surveys from 1993 through 1995 failed to document any nesting attempts, although a few hundred to a few thousand adults have been observed on the lake in any given year. A more recent visit to the site in 2013 also failed to document nesting (Gelvin-Innvaer pers. comm.). Documentation of the gulls’ presence at the second major site, Agassiz NWR, dates back to when the refuge was first established in 1937. Wetlands in the area were drained in 1911, but, following creation of the refuge, wetland restoration work soon attracted the birds. The first documented nesting occurred shortly thereafter in 1939 (Vorland 1984). Intermittent accounts over the years show population numbers ranging from zero nesting pairs to at least 125,000 in 1968, a year when nearly all the nests failed due to fluctuating water levels (U.S. Fish and Wildlife Service 1968). Between 2002 and 2005, the population varied from a low of 15,046 nests to a high of 71,924 nests (U.S. Fish and Wildlife Service 2005a). Then, for three consecutive years, the gulls began the nesting season at Agassiz but soon abandoned, moving instead to nearby Thief Lake WMA, located just 20 km north of the refuge. High predation was thought to be the primary culprit prompting the move; in other years moves have been a response to drought conditions. Generally, the gulls display such a strong tenacity to Agassiz, they relocate to Thief Lake only when the former site is deemed unsuitable (Vorland 1984). The history of the birds’ use of Thief Lake WMA is poorly documented. Janssen (1987) reported 5,000 to 10,000 nesting pairs in 1980 and Burger and Gochfeld (2009) reported 2,000 pairs in 1994, and none in 2005-2007, even though the Agassiz colony was reported to have relocated to Thief Lake those very same years. Although the number of nest sites is limited, each summer birds are reported from locations distant from any potential nesting sites. During the summer of 2014, for example, there were reports throughout the western, west-central, and southwest regions of the state and as far east as Goodhue and Steele Counties (Kessen et al. 2015). These may be post-nesting birds that are known to range widely following the breeding season, birds whose nests failed that year, or first-year birds. Although there is no definitive data on the age of first breeding, biologists believe it may be initiated at two years of age (Burger and Gochfeld 2009). During the MNBBA, participants reported 42 Franklin’s Gull records from only 0.8% (37/4,735) of the surveyed atlas blocks and from 0.9% (20/2,337) of the priority blocks. Breeding was documented in only 1 block on the Agassiz NWR (Figures 2 and 3; Table 1). A small group of 60 adults and immatures were observed at Salt Lake in early July 2013, but the birds were likely dispersers from a nearby colony in South Dakota. Adults were observed in several other western and west-central counties, including 1 record in Dakota County (Figure 2). The gull’s dependence on the Agassiz NWR is not unlike that seen elsewhere in its breeding range, where the establishment of large, managed wetland complexes has provided critical nesting habitat. The species’ expansion into many western states during the twentieth century is attributed, in part, to the creation of new refuges beginning in the 1930s. Burger and Gochfeld (2009) hypothesized that numbers may have increased in the 1920s only to decline in the drought years of the 1930s, when many nest sites disappeared. Some of the historic colony sites have never been reoccupied. *Note that the definition of confirmed nesting of a species is different for Breeding Bird Atlas projects, including the definition used by the Minnesota Breeding Bird Atlas, compared with a more restrictive definition used by the Minnesota Ornithologists’ Union. For details see the Data Methods Section. Breeding distribution of the Franklin's Gull in Minnesota based on the Breeding Bird Atlas (2009 – 2013). Summary statistics of observations by breeding status category for the Franklin's Gull in Minnesota based on all blocks (each 5 km x 5 km) surveyed during the Breeding Bird Atlas (2009-2013). Summary statistics for the Franklin's Gull observations by breeding status category for all blocks and priority blocks (each 5 km x 5 km) surveyed during the Minnesota Breeding Bird Atlas (2009-2013). Large, extensive wetland complexes are the chosen habitat of this species. Hemi-marshes, where stands of emergent vegetation are interspersed with open water, are preferred (Figure 4). Nests are usually placed at the interface of the emergent vegetation and the open water (Burger and Gochfeld 2009; Vorland 1984). Water level appears to be the most important factor in determining whether a site is selected for nesting. Reported levels at successful colonies range widely from a low of 15 cm to a high of 180 cm. If the water is too low when the birds first arrive, the entire colony will move to a different site. At Agassiz NWR, water levels less than 80 cm have prompted the colony’s abandonment (Burger and Gochfeld 2009). Even after nesting is initiated, rapidly rising water levels that threaten eggs and chicks can cause the colony to abort incubation and reinitiate efforts elsewhere or to totally abandon their efforts for the season (Beyersbergen et al. 2004). Although extensive wetland complexes were found throughout the Prairie Pothole Region prior to settlement, today the species is restricted largely to sites that are protected by the U.S. Fish and Wildlife Service and state natural resource agencies. In addition to protecting this vulnerable habitat, public land managers also control water levels at these sites to benefit a host of waterfowl, shorebirds, and marsh birds such as the Franklin’s Gull. Typical Breeding Habitat of the Franklin’s Gull in Minnesota (© Gary T. Seim). Establishing a population estimate for the Franklin’s Gull is challenging. Like most marsh-nesting birds, the federal Breeding Bird Survey (BBS) does not adequately survey the species’ remote, extensive wetland habitats. Because most colonies are now located on public lands, surveys by land managers and research biologists are often the best source of information. Nevertheless, waterfowl surveys are often the highest priorities on refuges, so surveys of other species are often not conducted or are conducted inconsistently, depending on available resources. In 2002 Kushlan and his colleagues estimated the North American population of the Franklin’s Gull ranged in size from approximately 316,000 breeding adults to 991,000 breeding adults. In 2008 the population in the Canadian Prairie Provinces alone was estimated at approximately 1.18 million birds (Beyersbergen et al. 2008), a region that supports nearly 70% of the species’ North American breeding population. More recently, however, Partners in Flight (2017) has reduced the North American population estimate to approximately 830,000 breeding adults. These numbers are at best broad approximations. Even general estimates are rarely available most years from some of the largest colonies, including in Minnesota. The most recent published data available for the Agassiz National Wildlife Refuge (NWR) and Thief Lake Wildlife Management Area (WMA) in Minnesota report that only 70 nesting pairs were present at Agassiz NWR between 2005 and 2007 and none were present at Thief Lake WMA, down dramatically from a combined estimate of 42,000 breeding paris in 1994 (Burger and Gochfeld 2009). These large and extensive wetland complexes can be difficult to survey and changes in water levels can lead to large-scale changes in colony activity. Nevertheless, a periodic assessment of the relative abundance of Franklin’s Gulls on each site would be helpful in assessing the species’ statewide status. Although the BBS data for the Franklin’s Gull in Minnesota are unreliable, the data are more robust when examined throughout the North American BBS survey area. From 1966 through 2015, these data show a statistically significant population decline of 2.95% per year; the decline has lessened since 2005 to 0.52% per year (Figure 5). Survey routes in the United States have shown a greater decline (6.07% per year) than those in Canada (2.12% per year). Unfavorable water levels are considered the primary problem. 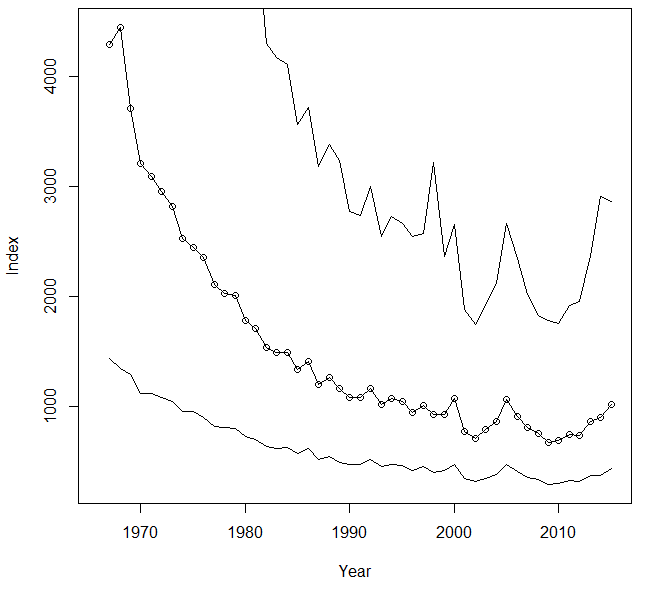 Breeding population trend for the Franklin’s Gull in North America from 1966-2015 based on the federal Breeding Bird Survey (Sauer et al. 2017). Like all colonial species that nest in large numbers and in localized areas, the Franklin’s Gull is considered a vulnerable species. However, at the continental scale, Burger and Gochfeld (2009) considered populations to be relatively secure (Burger and Gochfeld 2009), despite evidence of declines in both Canada and the United States. The nomadic nature of the species, often moving colonies from year to year in response to water levels, complicates the ability to accurately monitor population trends. Regardless, the population has expanded westward in the past century, establishing large, successful colonies in several western states. Nevertheless, the North American Waterbird Conservation Plan classified it as a Species of Moderate Concern (Kushlan et al. 2002). In 2014 the North American Bird Conservation Initiative (2014) designated it as a Common Bird in Steep Decline, and in 2017 Partners in Flight (2017) assigned it a Continental Concern Score of 14/20. The species’ relatively small population size coupled with threats to its breeding and wintering habitat, and—in contrast to Burger and Gochfeld’s assessment—its apparent population decline, prompted this high ranking. In Minnesota the Franklin’s Gull has been officially listed as a Special Concern Species since 1996 (Minnesota Administrative Rules, Chapter 6134); it also has been designated a Species in Greatest Conservation Need by the Minnesota Department of Natural Resources (2015). Audubon Minnesota identified it as a Target Conservation Species and prepared a conservation action plan, outlining an ambitious goal of maintaining a statewide population of at least 50,000 breeding pairs (Pfannmuller 2014). This number was based in part on relatively high population estimates at Agassiz NWR from 2002 to 2005 (ranging from 15,046 nests to 71,924 nests; U.S. Fish and Wildlife Service 2005a) and an explicit population goal established by the refuge, which supports the state’s primary breeding population. In the 2005 Comprehensive Conservation Plan for the refuge, the staff established a target of maintaining an average annual nesting population of 20,000 Franklin Gull pairs (U.S. Fish and Wildlife Service 2005b). Unfortunately more recent data from Agassiz and from other nesting colonies in the state suggest that such a goal may indeed to be too high. Periodically monitoring Minnesota’s primary nesting sites is critical to provide even a rough approximation of the status and size of nesting colonies and to assess the overall status of Minnesota’s Franklin Gull population. Management recommendations for the species are quite general and focus principally on managing water levels so they are maintained at stable levels throughout the nesting cycle. Unless there is a strong history of conservation practices in a wetland’s watershed or unless water levels are actively managed on publicly owned wetlands to benefit the Franklin’s Gull, the species remains extremely vulnerable to changing conditions. The importance of the Thief Lake WMA as an alternative nesting site in close proximity to Agassiz NWR illustrates the importance of maintaining large wetland complexes throughout the landscape and of coordination among agencies. Perhaps the most important conservation strategy in Minnesota is provided by the Minnesota Prairie Landscape Conservation Plan (Minnesota Prairie Plan Working Group 2011). Implemented by a consortium of public resource agencies and private conservation organizations, the plan places an equal emphasis on grassland and wetland protection, restoration, and management. Conservation measures that protect riparian areas and restore shoreline habitats are critical to keeping water on the land rather than simply moving it downstream to large wetland basins, where rapidly changing water levels threaten the nesting success of so many marsh-nesting birds. Wetland conservation alone may not be enough to ensure the future of the Franklin’s Gull. Warming temperatures may pose a risk as well. Species that depend on wetlands in the Prairie Pothole Region are particularly vulnerable, since drought conditions and more extreme weather events are predicted to increase in the coming years. A recent modeling analysis by the National Audubon Society projected a 99% loss of the current summer breeding range of the Franklin’s Gull by the year 2080 and classified the species as “climate threatened” (Langham et al. 2015; National Audubon Society 2017). The future of this inland “seagull” does indeed seem precarious. Beyersbergen, Gerard W., Wendy A. Calvert, Ron C. Bazin, Sam J. Barry, and Bev A. Gingras. 2008. Spatial and Temporal Distribution and Abundance of the Franklin's Gull in the Canadian Prairie Provinces: 2005–2007. Canadian Wildlife Service Technical Report no. 504. Alberta: Canadian Wildlife Service, Prairie and Northern Region. Green, Janet C., and Robert B. Janssen. 1975. Minnesota Birds: Where, When and How Many. Minneapolis: University of Minnesota Press. Hertzel, Anthony X., and Robert B. Janssen. 1998. County Nesting Records of Minnesota Birds. Minnesota Ornithologists’ Union Occasional Papers, no 2. Minneapolis: The Minnesota Ornithologists’ Union. Janssen, Robert B. 1987. Birds in Minnesota. Minneapolis: University of Minnesota Press. Kessen, Ann E., Peder H. Svingen, and Paul E. Budde. 2015. “The 2014 Summer Season, 1 June through 31 July 2014.” Loon. 87: 9–32. Roberts, Thomas S. 1932. The Birds of Minnesota. 2 vols. Minneapolis: University of Minnesota Press. Shedd, Mary, and Steven G. Wilson. 1987. “The Summer Season, June 1 to July 1, 1986.” Loon 59: 19–35. U.S. Fish and Wildlife Service. 2005a. Agassiz National Wildlife Refuge Colonial Nesting Bird Surveys, 2005. U.S. Fish and Wildlife Service. 2005b. Agassiz National Wildlife Refuge Comprehensive Conservation Plan. Vorland, Jeannine. 1984. Franklin’s Gull (Larus pipixcan) Breeding Colonies and Associated Habitats in Minnesota, 1984. Progress report to the Minnesota Department of Natural Resources, Nongame Wildlife Program. Wilson, Steven G., and Mary Shedd. 1986. “The Summer Season (June 1 to July 31, 1985).” Loon 58: 21–38. The Minnesota Breeding Bird Atlas Website was a collaborative project led by Audubon Minnesota and the University of Minnesota, Natural Resources Research Institute. Major funding was provided by the Minnesota Environment and Natural Resources Trust Fund as recommended by the Legislative-Citizen Commission on Minnesota Resources (LCCMR). © 2019 Copyright Minnesota Breeding Bird Atlas.